In a public decree, Pope Francis stated that in order to move the religion to the modern era, the official name of Roman Catholicism should be changed to Pritzianity. 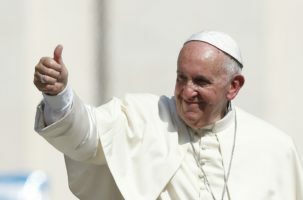 No other reasoning was given for the change other than that the new name “sounds cool,” and it was stressed that the name change had nothing to do with the large, anonymous donation the Holy See had received from the Chicagoland area. Pressed for further comment, Pope Francis fiercely defended the widely panned decision to jettison nearly two millennia of consistent branding. Sources in the Vatican indicated that the anonymous donor was unsatisfied with the public response to the name change, and for some reason was demanding that Pope Francis declare Illinois Governor Bruce Rauner to be the Antichrist.